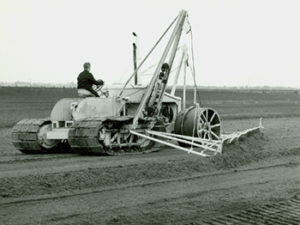 A tractor specially designed to perform the milled peat ridging operation at more than twice the speed of the L.H.T. II & III by covering the full width of the field in one pass. The chassis is fabricated from standard rolled steel sections mounted on half-tracks which incorporate our manganese track links and sprockets with intermediate support rollers. Timber swamp shoes are bolted to the track links. The power unit is a diesel engine with automotive type clutch and it drives through a heavy duty automotive type gear box and cardan shaft – the differential unit of a standard heavy duty truck back axle with epicyclic gear reduction between half shaft and wheel hubs. The track sprockets are bolted directly to the axle hubs. The tractor is carried on front rollers of generous proportions carried on stub axles and steering is powered by hydraulics. The engine is fitted with two hydraulic pumps, one for power steering and the other for the attachment hydraulic system. The attachment consists of double blades similar to the single ridger attachment, one blade on either side of the tractor converging at the rear. The blades are supported by sturdy spars which radiate from the tractor chassis. Adjustment of the sole-plate of the blade relative to these spars is provided. The attachment is lifted and lowered hydraulically through a multi-guy rope system over the top of a central mast on the tractor. Read about Ridger Attachments - used to create ridges out of the milled peat.